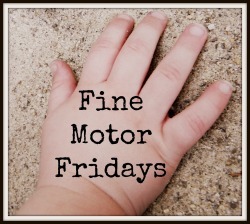 It’s Fine Motor Friday! Every Friday in October Lalymom, Craftulate, School Time Snippets, Next Comes L, and myself will be posting fun activities that promote development of fine motor skills. So after reading this post you will want to go check out what fun they have posted about! I’ve wanted to make some “stained glass” art with Caden for some time now. We have tried various methods in the past, but with limited success. This project is done in two parts, and we took several days to complete it. Anyway, it’s a really easy project, show your child(ren) how to squeeze the dropper to fill it up with colored water and let it drip or squirt it onto the paper towel. The squeezing motion using a small medicine dropper is a great way to work those fine motor muscles! For older children, have them try a medicine syringe. Younger toddlers might have an easier time working a turkey baster, using their whole hand. Caden had a lot of fun with this part! He probably spent a good 30 minutes just filling up the dropper and squirting it onto the paper towel before he started mixing the colors and making a mess. When you are finished dying the paper towel and making a mess, lay or hang the paper towels to dry. In the next day or two, once the paper towels are dry you can cut it to create a “stained glass” jack-o-lantern, ghost or any other Halloween symbol you can think of. To make a jack-o-lantern, you or your child can cut shapes out of black construction paper to create a face. I used a hole puncher to cut little black circles for the ghosts’ face. I think Caden would have love to try the hole puncher but I didn’t think to let him until after I had already done it. With the orange construction paper cut out a pumpkin shape with the center cut out. Glue the paper towel over the center cut out, and then let your child(ren) glue on the black shapes to make a jack-o-lantern face. When the glue is dry, tape it up in a bright window and enjoy! Then Caden glued the little black circles to make a face on the white-ish paper towel. I then cut out a ghostly shape, but an older child can do this themselves. These made really cute and simple ghost “stained glass” Halloween decorations. Facebook , Twitter, Google + and Pinterest! Thanks! He did a good job on his pumpkin! I love when simple-to-do crafts turn out looking lovely. This one fits the bill! awww thanks Emma! They do look cute in our windows! What a great way to work on those fine motor skills & create a fun project for Halloween. Love it! I’ve featured you at this week’s Pinning for Play link party! Thanks for linking up with us.